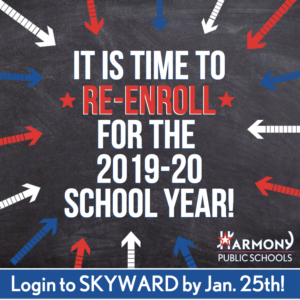 It is time to re-enroll for 2019-20 school year! Please click the link below to see how to complete the re-enrollment online. https://harmonypublicschools.network/hsaelpaso-new/wp-content/uploads/sites/121/2017/10/HSA-El-Paso-white-letters-300px.png 0 0 tkilic https://harmonypublicschools.network/hsaelpaso-new/wp-content/uploads/sites/121/2017/10/HSA-El-Paso-white-letters-300px.png tkilic2019-01-14 11:55:092019-01-14 11:56:09It is time to re-enroll for 2019-20 school year!